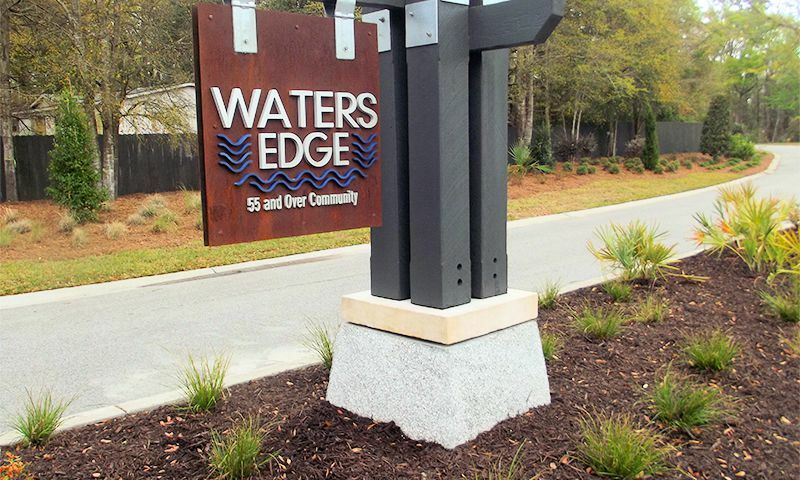 Waters Edge is a gated community in North Myrtle Beach, South Carolina. This costal neighborhood provides residents with a low-maintenance lifestyle paired with charming amenities. With just 75 homes, residents will enjoy being able to get to know their neighbors in this quiet neighborhood while enjoying their prime location in North Myrtle Beach. The clubhouse at Waters Edge provides a fitness room for residents looking to keep in shape and an outdoor covered porch for relaxing with friends in the shade. Outside the clubhouse, there is a swimming pool and sun deck that includes a fire pit for residents to enjoy. A small activity area with two horseshoe pits is available for you to challenge friends and neighbors to a fun game. Construction began in 2017 by D.R. Horton and the community will consist of just 75 single-family homes upon completion. Homebuyers can choose from four distinct floor plans that range in size from 1,588 to 1,883 square feet. They have a den and two or three bedrooms, two or three bathrooms, and an attached two-car garage. These detached residences feature energy-efficient designs, open layouts, gourmet kitchens, elegant master suites, inviting living and dining rooms, and flex rooms. Homeowners can take advantage of living in this maintenance-free community thanks to the homeowners' association that handles lawn care and snow removal. Residents have more time to pursue new hobbies and activities at their leisure. They can go for a morning stroll or jog around the neighborhood for some exercise or spend time outdoors on a sunny day appreciating nature with the many creeks that surround the community. Located in North Myrtle Beach, South Carolina, Waters Edge enjoys a convenient location near beaches, shopping, dining, and attractions. Highways 65 and 17 are close by, making driving around town is a breeze. Homeowners are surrounded with great attractions and entertainment like the Intracoastal Waterway, North Myrtle Beach Fishing Charters, Harbor View Golf Course, and The Valley at Eastport Golf Club. Restaurants, bars, retail shops, a bank, CVS Pharmacy, and post office are just a few minutes away. Residents will love having easy access to miles of shoreline along the Atlantic Coast and plenty of beaches for fun in the sand and sun. For additional entertainment, active adults can drive to Myrtle Beach or, when traveling farther is needed they can also catch a flight out of Myrtle Beach International Airport which is about 30 minutes away. Waters Edge is a charming community with plenty to offer all homebuyers in South Carolina. There are plenty of activities available in Waters Edge. Here is a sample of some of the clubs, activities and classes offered here. 55places.com is not affiliated with the developer(s) or homeowners association of Waters Edge. The information you submit is distributed to a 55places.com Partner Agent, who is a licensed real estate agent. The information regarding Waters Edge has not been verified or approved by the developer or homeowners association. Please verify all information prior to purchasing. 55places.com is not responsible for any errors regarding the information displayed on this website.